Loan-shark victim jumps to death clasping child. 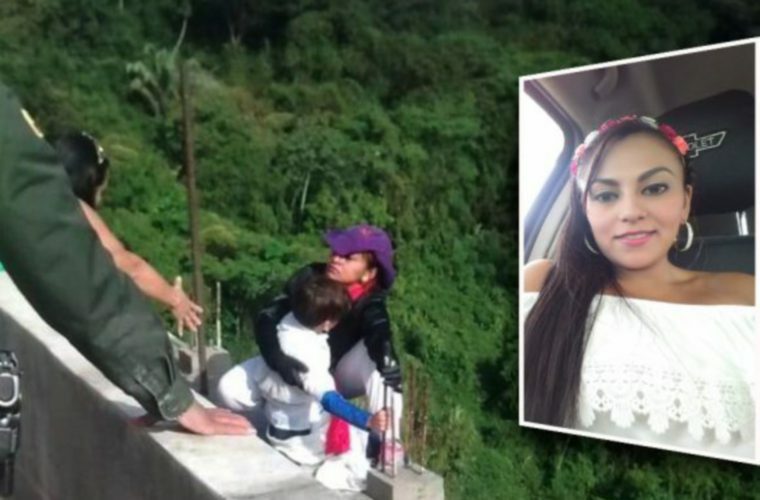 A 32-year-old single mother holding her 10-year-old son jumped from a bridge in Ibagué, Colombia on Thursday, February 8 watched by police, firefighters lifeguards, and psychologists who had tried to dissuade her. The incident has been widely circulated on social media, with some of the would-be rescuers visibly shaken by the outcome. Rafel Rico, Ibagué Fire Commander, said on Blu Radio that "it seems that they asked her to please not make the decision, they tried to dissuade her, but unfortunately, she made the fatal decision". After the suicide, policemen and others who were close to the woman are seen breaking down in tears. The woman studied administration at the Cooperativa de Ibagué University. decided to end her life due to debts with moneylenders. In a 'drop by drop', system that is illegal in the country, where individuals lend money with high-interest rates. "It has to do with something monstrous that is happening not only in Ibagué but in Colombia as a whole, which is the drop by drop," said a senior official "It not only extorts people, not only steals all their work but also intimidates them, steals all their work, threatens them with death.